There are 16 Assisted Living Facilities in the Perrysburg area, with 4 in Perrysburg and 12 nearby. The average cost of assisted living in Perrysburg is $4,500 per month. This is higher than the national median of $3,346. Cheaper nearby regions include Maumee with an average starting cost of $3,750. To help you with your search, browse the 69 reviews below for assisted living facilities in Perrysburg. On average, consumers rate assisted living in Perrysburg 3.9 out of 5 stars. Better rated regions include Maumee with an average rating of 4.8 out of 5 stars. Caring.com has helped thousands of families find high-quality senior care. To speak with one of our Family Advisors about assisted living options and costs in Perrysburg, call (855) 863-8283. The city of Perrysburg, Ohio, is near the Toledo Metro area, a large port city with access to the Great Lakes. Residents over 65 make up 13.9 percent of the Perrysburg population, and this city offers 29 assisted living facilities to choose from. Four of these are located within Perrysburg, and another 25 are in towns nearby. Assisted living in Ohio falls under the designation of Residential Care Facilities (RCFs), which are licensed and inspected by the Ohio Department of Health. These facilities accommodate 17 or more unrelated elders in a homelike setting and offer personal care services such as medication management or assistance with daily living. The Perrysburg area is home to world-class medical facilities, including Mercy Health, in the event of medical emergencies or illness. The winters in Perrysburg are cold, with an average low temperature of 18 degrees in January and 31 inches of snow, which can make it difficult for seniors to be active. The summers are warm with an average temperature of 84 degrees in July. Seniors and their loved ones can feel safe living here due to the low crime rates. Violent crime is rated at 20.7 out of 100 (1 being the safest), which is much lower than the national average of 31.1. Likewise, property crime is rated at 31.2, which also lower than the national average of 38.1. The cost of living average score for Perrysburg is 98.1, compared to the United States average of 100. Seniors on a budget can enjoy living in a city where they can more easily afford daily shopping and entertainment. Seniors who need assistance getting to doctor’s appointments, local shopping or for entertainment can use Perrysburg Transit, a door-to-door transportation service. Each bus is wheelchair accessible and operates seven days a week. The American Lung Association has given Perrysburg an air quality ozone score of C, which may affect the health of seniors living with respiratory illnesses. Assisted Living costs in Perrysburg start around $4,500 per month on average, while the nationwide average cost of assisted living is $4,000 per month, according to the latest figures from Genworth’s Cost of Care Survey. It’s important to note that assisted living rates in Perrysburg and the surrounding suburbs can vary widely based on factors such as location, the level of care needed, apartment size and the types of amenities offered at each community. 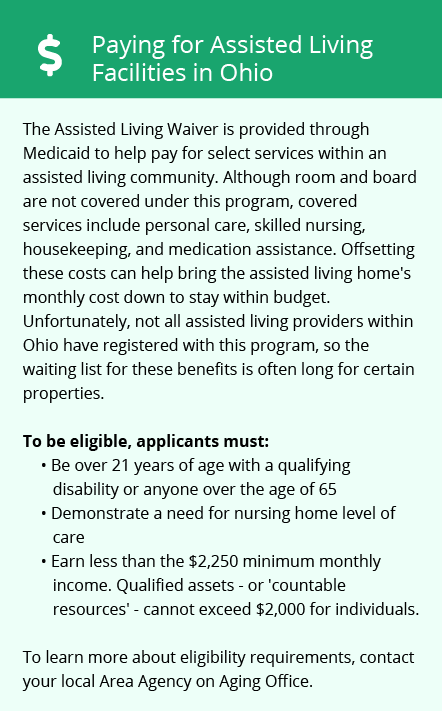 There are two Medicaid Home and Community Based Services waivers available to help pay for assisted living in Ohio. 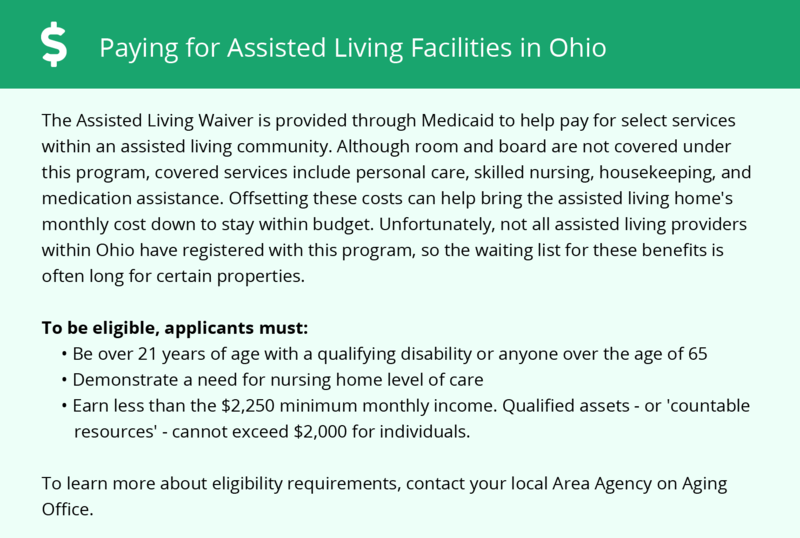 One is the Assisted Living Waiver, and the other is a managed Medicaid program called the MyCare Ohio Plan (MCOP) for those who are dually eligible for Medicaid and Medicare. In addition, Ohio offers the Residential State Supplement (RSS) program which is provided by the Ohio Department of Mental Health and is available to those enrolled in Medicaid. Perrysburg and the surrounding area are home to numerous government agencies and non-profit organizations offering help for seniors searching for or currently residing in an assisted living community. These organizations can also provide assistance in a number of other eldercare services such as geriatric care management, elder law advice, estate planning, finding home care and health and wellness programs. To see a list of free assisted living resources in Perrysburg, please visit our Assisted Living in Ohio page. Perrysburg-area assisted living communities must adhere to the comprehensive set of state laws and regulations that all assisted living communities in Ohio are required to follow. Visit our Assisted Living in Ohio page for more information about these laws.